If you were impressed with the former Chrome Soft ball, just wait until you've seen what Callaway has done to the revamped version for 2016. The key change this time around is the ball is now a 4-piece construction rather than a 3-piece design and features a new Dual SoftFast Core. Essentially, Callaway is taking its best core technology here and placing it inside its leading golf ball product. Callaway told us during testing out in Dubai last month that this softer core helps reduce the amount of spin off the tee. This is because the ball is able to be compressed more fully on full swings, and as the core compresses and the ball compresses, the player is not able to generate as much torque which results in less spin. During testing, we saw exactly that as we received an additional 2mph ball speed, 10 yards of distance and 150 RPM less spin when striking the new Chrome Soft against its older model with Callaway's new XR 16 driver. Other improvements include a softer and buttery feel with the wedges and approximately 100 RPM more spin when comparing the new and old Chrome Soft balls with a 56-degree Mack Daddy 3 wedge. Callaway's HEX aerodynamics also aided a straighter flight with clubs through the bag, especially when the wind picked up - so this quashes the slight niggle we had on the former Chrome Soft in the sense it did not feel the easiest to control or hit straight. We also felt the soft Tour Urethane cover provided better durability than before, as few scuff marks were noted despite several thinned long iron shots. 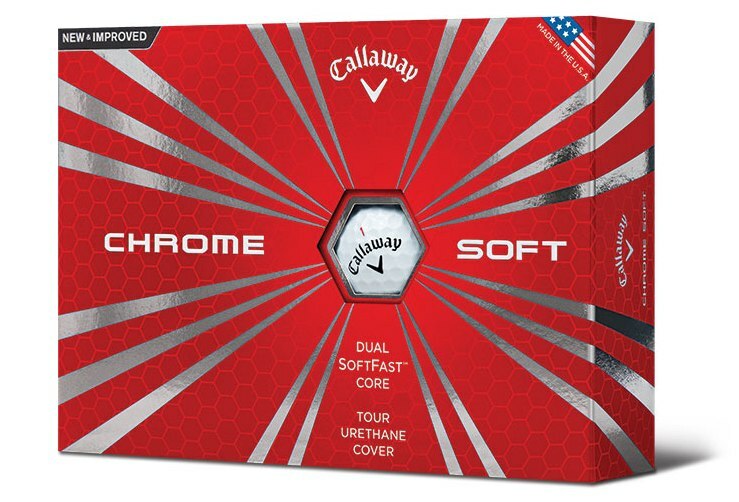 In terms of looks, Callaway is sticking with its vibrant red box and retaining the "Chrome Soft" name on its ball, as this is now very much a franchise for the brand given its success. The ball is also differentiated from the old version with two dots on the logo. The new Chrome Soft is a golf ball that players of all abilities are likely going to fall in love with, especially given the £32.99 price tag. Buttery and soft with the wedges, flies off a tee peg and generally feels like it's on a piece of string. Available a week before Valentine's Day on February 5, we recommend you find a place in your heart for the new Chrome Soft.